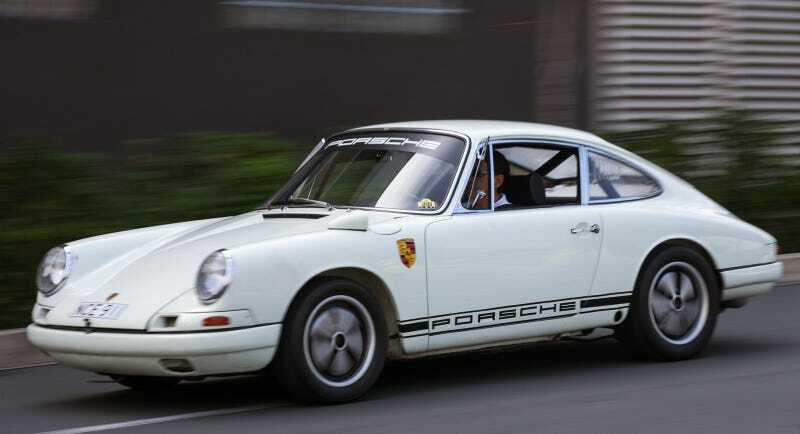 Remember the 1967 Porsche 911R? It’s was a stripped-down, lightweight 911 with racing in its name, and rumor has it Porsche is celebrating the model’s 50th Anniversary by selling a limited run of throwback-styled 911s - and they’re already sold out. The appeal of the 901 911R was that its sole purpose was to do everything great the 911 did, but faster. Weight was reduced by stripping out the interior and replacing almost every possible panel and window on the car with a lighter alternative. The result was a racing-bred 911 that managed to cut 500lbs off the standard model’s bloat. In celebration of that car, it has been reported that Porsche plans to sell a limited edition run of current-generation 911 that will be inspired by the retro 911R, and it will go by the same name. According to a few sources on Porsche fan sites all of the retro models have already been sold. The appeal of the 911R is skipping the more elaborate styling of Porsche’s other performance models like the GT3, meaning no giant wing or aggressive bumpers, but keeping the performance. The 911R was also notable for its circular tail-lights. It wasn’t notable for winning races, however, with only one customer car ever winning a large race. The idea of the car is to make a 911 as lightweight as possible, but with this new 911R being a celebratory model, we’ll see just how drastic a change Porsche decides to commit to. The car is said to get either the 3.8 liter GT3 or 4.0 liter GT3 RS six-cylinder engine mated to a manual transmission. The current generation GT3 hits 60 in 3.3 seconds and has a top speed of 195 mph - a lightweight version built off of those numbers should be spectacular. The current GT3 also starts around $130,000, and it’s safe to assume the special 911R Porsche has planned will be quite a bit higher. Somewhere between 600 to 800 copies will be made - a big up from the original run of only 20 racing cars and four prototypes. The car will be officially unveiled sometime in June for the 2017 model year, 50 years after the introduction of the original 901 911R in 1967.